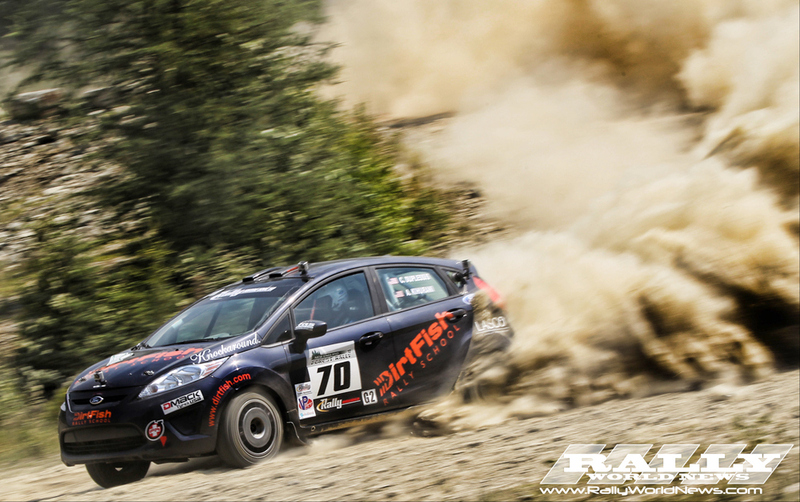 Newry, Maine– Canadian Antoine L'Estage from Quebec and co-driver Nathalie Richard from Halifax, Nova Scotia topped an international sweep of the overall podium at the 2012 New England Forest Rally. Antoine’s gamble to run first on the road was pivotal to his victory. Despite fighting for grip on the first pass on the loose gravel, Antoine had a clear view unlike those who struggled in his dusty wake. This year’s New England Forest Rally returned once again to the beautiful Sunday River Mountain Resort in Newry Maine, for its headquarters. 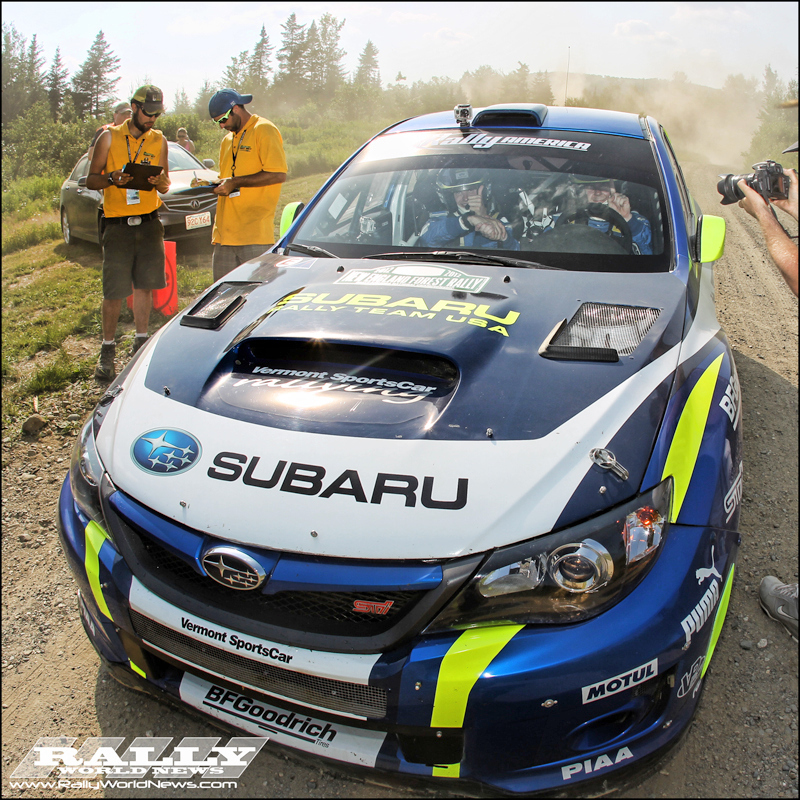 After a meet and greet with the fans, the first stage of the rally got underway Friday morning with a short mixed surface stage at Sunday River Resort. L’Estage took the short stage win over Subaru’s David Higgins. Unfortunately, this short .55 mile stage would see the departure of Travis and Terry Hanson in their SP Class Subaru STI. After making the transition from the gravel to tar, Travis got caught out on an uphill right turn that had a considerable amount of dirt and stones that was pulled out by the cars ahead of him. 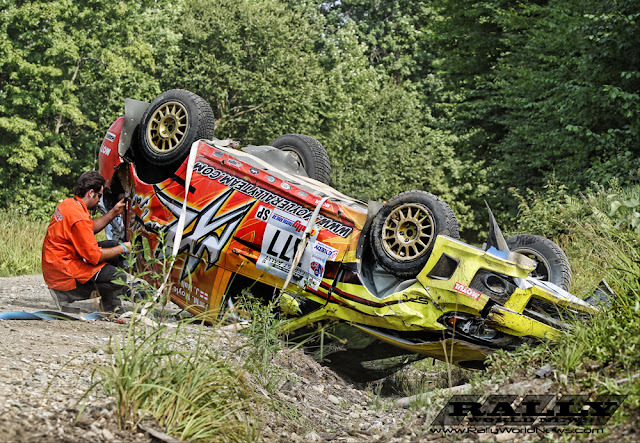 With the combination of gravel tires on tar and the loose stones and dirt, Hanson’s Subaru broke free, crossed the road and impacted several large boulders. Their rally was over before it ever got going. Although they seemed fine after the crash, Terry [co-driver] was feeling uncomfortable the next day and, after been checked out at the hospital, was found to have several fractured ribs. This was most likely the last we will see of this much liked father and son team this year, as it looked like the car may needed a lot of TLC, or even a new shell. On to “Concord Pond”, SS2. As we had thought, after viewing the changes to the stage during recce there was a very high possibility that the insane stage time set by Ken Block in 2009 would be reset. Running first on the road with no line to follow, L’Estage took the bit between his teeth, committed 100% to his notes, threw all caution out the window and he attacked the stage hard. Not only did Antoine and co-driver Nathalie Richard take the stage win over David Higgins by 14 seconds, they also shattered Ken Block’s record by a full 9 seconds. Of course, the rally community will debate that several of the crests and the large rock jump near the end of the stage have been removed or smoothed slightly, but setting aside these changes, the stage is the same length, and there are no fewer turns. Antoine set a remarkable time and now a new stage record. Should Ken Block return to Maine in 2013, you would be well advised to purchase your VIP bus tickets to Concord Pond stage now!! After a quick service, the cars headed north to tackle SS3 and SS4 Icicle Brook North/South, a turnaround stage. At 16.23 miles stages 3 & 4 are the longest staged of the rally. A big push from Higgins on these stages could very well give him first on the road on day two and free from the wall of dust. With active logging in the area of SS3-4, there have been some significant improvements made to this stage road from last year. This was especially noticeable in the area of the pond loop. Nonetheless there was a still lots of loose gravel for Antoine to sweep. Antoine opted to ease the pace a little on SS3 hoping that the dust would keep Higgins at bay. But Higgins pushed through the fine white dust and finished just 4 seconds behind L’Estage. Because of the heavy dust reported by the competitors, rally organizers would allow a three minute gap between the first three cars and two minute gap for everyone else. **Despite having the three minute window and not having to battle as much dust, Higgins was still a whopping 12.7 off the pace of Antoine on SS4. As day one came to a close, Antoine had amassed a 32 second lead over David Higgins and, more importantly, maintained his first place on the road heading into day two. “Crazy” Leo Urlichich was an additional 58 seconds back from Higgins holding down third overall. 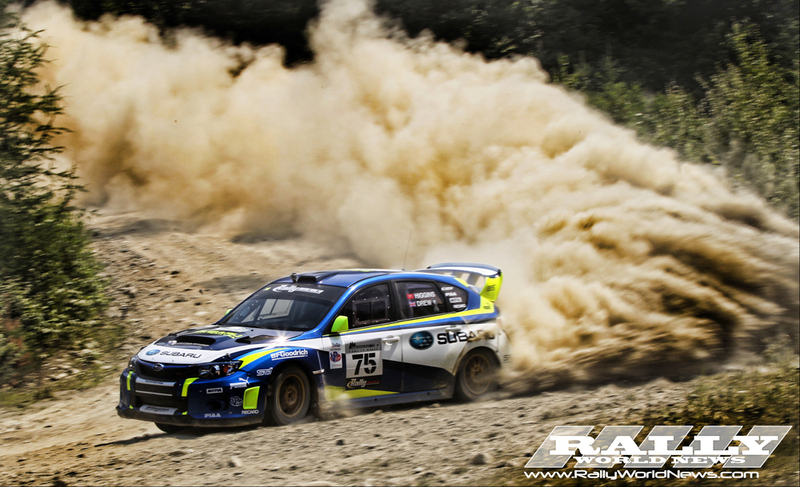 The battle that was expected between defending Rally America 2WD champion Chris Duplessis and Australian driver Will Orders did not disappoint. On one side you have Duplessis, a native of Mainer, running on stages that he has competed on many times before and which he holds the 2wd stage records. On the other side you have “Big Will” Orders, an Australian who is in Maine for the very first time. His advantage is his mighty tail-happy Nissan Silvia that has a good 300bhp over Duplessis’s Fiesta R2. Orders would set the faster time on SS1 but, as expected, Duplessis would take it to the Aussie on Concord Pond. Chris would also go on to take the stage win on SS3. 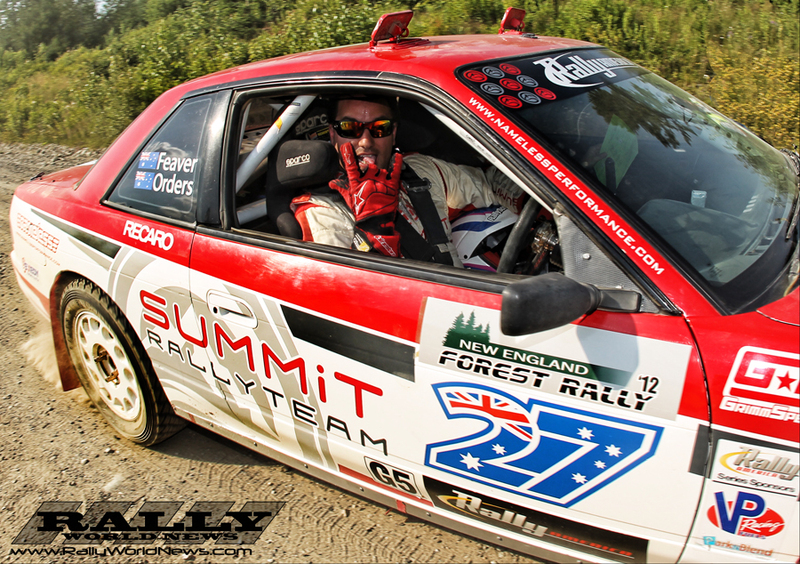 Orders would roar back on SS4 taking a decisive stage win over Duplessis. In doing so Orders also pulled ahead of Duplessis in the standings. At the end of day one it was Orders, Duplessis and Chris Greenhouse in the Dodge leading the 2wd charge. Rally organizers would decide to carry the extended dust window into day two as there was no rain in sight. So the first three cars on the road would have three minutes, whiles ever one else would have a two minute dust window. Day two started with another short Spectator Special around the Sunday River resort. L’Estage would grab another victory on the short .55 miles test. From Sunday River the rally headed northwest to Errol, New Hampshire where service would set up for day two. Due to a scheduling conflict with the regular stage roads the rally would use some new stages in 2012. As we mentioned in our earlier report, these stages were a stark contrast from the rocky “car breaker” stages of prior years. The new stages were a mix of wide open, flat-out smooth gravel with several narrow twisty tight, yet smooth, sections to keep co-drivers on their toes. These new stages also somewhat leveled the playing field taking away the advantage from regulars to Maine who knew the old stages like the back of their hands. Unfortunately SS6 would be the last we would see of “Crazy” Leo. While sitting firmly in third overall, Leo would go off on a rather simple right turn and ended up in a small moose pond. Despite trying for several minutes, Leo was unable to budge his Subaru and called it quits. The off was put down to driver error, “Eh.. a bit sad about yesterday's off... I haven't made a mistake like this before,” Leo posted on Sunday to his 19,000+ fans on Facebook. With Leo’s departure, fellow Canadian and new comer to the Rally America series, Ugo Desgreniers and co-driver Erik Kirby would move up to third. Higgins would light the wick on SS7, “Hampshire Hills CCW,” and charge to victory over L’Estage. This was the first stage victory for Higgins in the rally. After a service stop in Errol the drivers would run SS6-7 in the reverse directions to make up SS8-9. Antoine, who was now focused on preserving his lead, began to take a more cautious approach in his driving so Higgins would take victory on SS8-9. After another short service the drivers would tackle the final two short back-to-back stages of a very hot and dusty Maine Forest Rally. When the cars rolled through the final time control on SS11 it was a bittersweet victory for RockStar Energy sponsored team of Antoine L’Estage and Nathalie Richard as they took their third consecutive win at the New England Forest Rally. 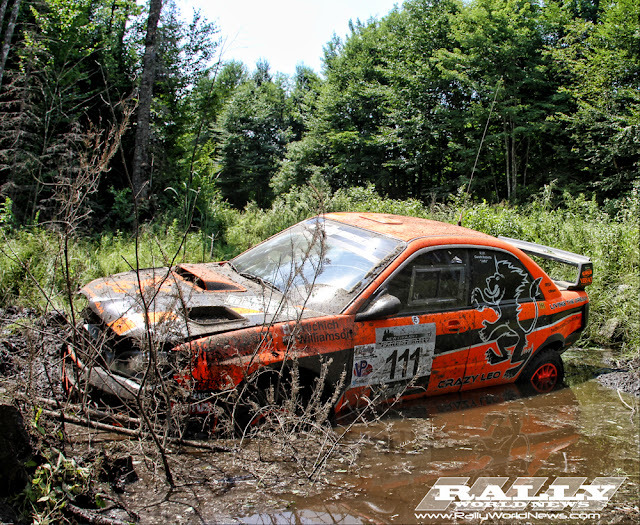 It was a bittersweet victory because of the mechanical issues they suffered at 100aw and Oregon Trail Rally cost them another chance at the Rally America Championship. Antoine has shown on more than one occasion this year that despite not having the budget of his Subaru counterpart, he most definitely has the speed on the stages to take it to the factory backed team. We are often left wondering just how fast L’Estage would really be if we were to see the #17 back on a factory supported car again. Pulling up to the end of the final stage David Higgins pulled up to the line to claim second, and in doing so clinched his second consecutive Rally American Championship for his Subaru USA Rally Team. Nonetheless, one could clearly see that David was not satisfied with second at the event. "The first day of New England was pretty horrible," said Higgins, "Dust breaks your rhythm all the time. You go flat out in sixth gear then you hit a cloud of dust. The organizers did a great job rescheduling the rally the next day. It's a great team effort and a big relief to put this championship in the bag." 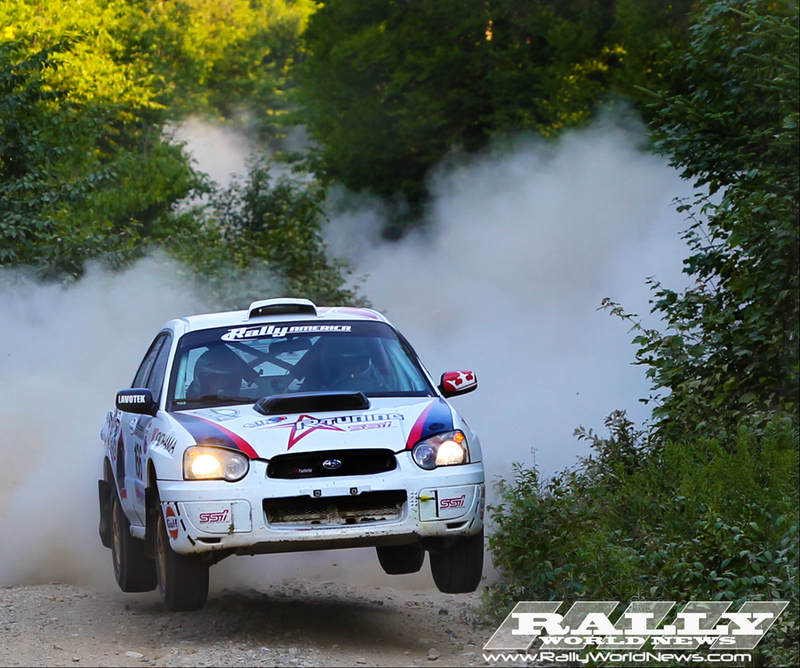 Ugo Desgreniers and Erik Kirby held on to third after the departure of “Crazy” Leo to take their first Rally America podium in their 2005 Subaru WRX STI. It truly was an international sweep of the overall podium with not a single American in sight. With the early departure of the defending SP Champion Travis Hanson, who is always a hot favorite for the SP podium in Maine, Ramana Lagemann and co-driver Chrissie Beavis in their Subaru STI opened a 3 minutes 55 second lead to take victory over their nearest rivals David Sterckx and Karen Jankowski who were also in a Subaru. "Honestly, it was a battle with a short rally course. So many cars had problems but we had less. We never pushed 100% and had two tire punctures. We are glad to finish our season with a win," said Ramana after the rally. 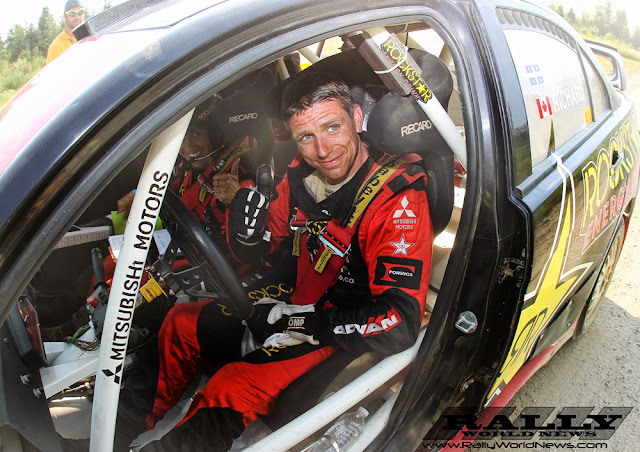 Current SP class point’s leader Lauchlin O'Sullivan and co-driver Scott (WHOOO????) managed to finish third after a somewhat challenging weekend. 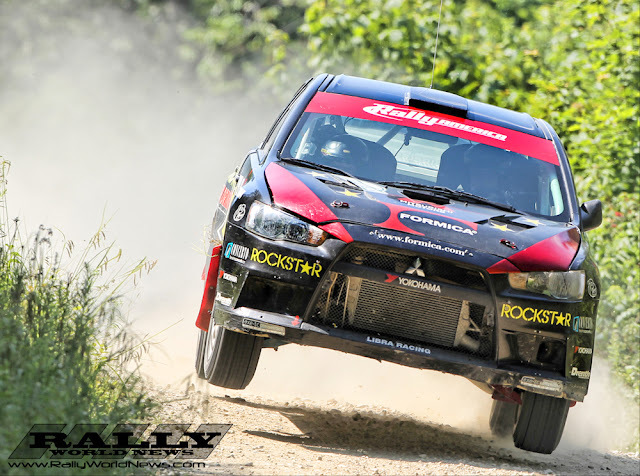 Lauchlin O’ Sullivan has merely to start the next round to clinch the SP Championship, but we know Laughlin and Scott will be gunning to cap off their championship year with a victory at Olympus, the final rally on the 2012 Rally America Championship. In 2WD, despite a solid run by Chris Duplessis and co-driver Alexander Kihurani in the DirtFish Fiesta, there was just no catching “Big Will” Orders in the Summit Rally Team Nissan on the fast flowing stages on day two. Down 40 seconds to the Aussie, Duplessis would have to settle for second. “Who’s on Third?” There was a little bit of musical chairs going on as the organizers tried to decide who would be awarded third overall in 2WD. First we had a podium with Andrew Comrie-Picard and Jeremy Wimpey in the Scion Racing XD in third. Then we had a second podium where we had the Summit Rally Team's Ross Allan and Scott Allan in third. It appeared after two days of racing that both drivers had the exact same time: 1:22:19.2!! In the end it was settled with a third place tie but the championship points were awarded to Comrie-Picard for winning more stages at this rally than Allan, who was awarded fourth place points in class. Much like the SP Championship, the 2WD title battle will now be settled at Olympus Rally. And just to add another twist to the mix, it is looking like “Big Will” Orders may be sticking around to have another crack at the podium. It is unclear at this time if he will still have his Nissan available for Olympus. You can be assured that the many fans that the Summit Rally Team have amassed in their short time in the USA will be taking a knee in hopes of one more appearance by “Big Will” and his most awesome RWD Silvia. 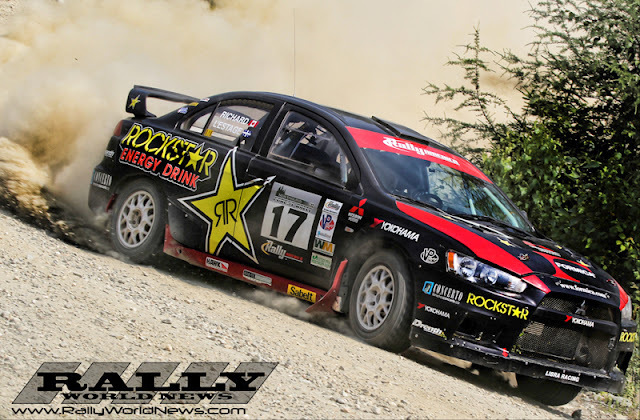 With the 2012 overall championship title clinched by Higgins in Maine, although he will not readily admit it, Higgins will have his sights clearly fixed on taking it to Ken Block’s Monster World Rally Team at Olympus in September. Block put a whole lot of hurt on Higgins at 100aw Rally earlier this year and Higgins hasn’t forgotten that. Although Antoine L’Estage was not planning to attend Olympus now that the championship is no longer up for grabs, we get a feeling that over the next few months, L’Estage will find it hard not to be in this battle with Higgins and Block. We also hope to see “Crazy Leo” back for Olympus. An entry from Pat Richard would also come as no surprise. Throw in the fact that the Olympus Rally will make a return to the old WRC stages for 2012, the final round of the 2012 Rally America season is shaping up to be very interesting. Stay tuned for updates as they unfold. **Report edit @ 4;55pm - incorect stage margin.